Mrs. Martha (Joyner) Swihart, 95, of Eden Heights, Olean, NY, formerly of Salamanca and Great Valley, NY died unexpectedly Saturday morning, February 2, 2019 at home. Born May 2, 1923 in Brownsville, TN, she was the daughter of the late Thomas and Margaret Brantley Joyner. She was married April 28, 1944 to Robert J. Swihart, who predeceased her in 1973. She was a graduate of Sand Hill High School, Class of 1942 in Morton, MS.
Marty was never afraid of work and held multiple jobs. She had been employed in many area restaurants as well as the former Fancher Furniture Company. She attended the 1st Baptist Church in Salamanca and was a member of the Salamanca Senior Center, American Legion and Veterans of Foreign Wars Ladies’ Auxiliaries, the Holy Cross Athletic Club, and the former Moose Lodge auxiliary. She enjoyed spending time with her family. 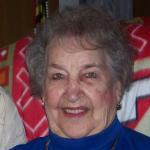 She liked bowling, bingo, cards, and billiards, was an avid Buffalo Bills fan, and enjoyed country music and dancing. Surviving are: three daughters, Rebecca “Becky” (Daniel) Kruszynski, Great Valley, NY, Margaret “Margo” (Jack) Pearl, Great Valley, NY, Lisa (Patrick) Lesseg, Oklahoma City, OK; two sisters, Dewett Smith, Baton Rouge, LA, Mary Strickland, Shreveport, LA; sixteen grandchildren; Gary (Sambol) Kruszynski, Edmond, OK, Daniel (Carla) Kruszynski, Ellicottville, NY, Jason (Alicia) Pearl, Franklinville, NY, Joshua (Kristin) Pearl, Salamanca, NY, Melissa (Benjamen Roblee) Pearl, West Valley, NY Johnathon Pearl, Midland, TX, Kimberly John, Middletown, NY, Brenda (William Kash) Swihart, Erie, PA, Danielle (Peter) Borja, Tokyo, Japan, Timothy (Olivia Lineman) Chudy, Salamanca, NY, Renee (Joseph) Freaney, Great Valley, NY, Justin (Ashley) Chudy, Salamanca, NY, Harley (Darrell Jeffries) Williams, Oklahoma City, OK, Cali Williams, Oklahoma City, OK, Michele (Rusty) Barber, Jones, OK, John (Renee Hollier) Lesseg, Oklahoma City, OK; twenty-six great-grandchildren; several nieces and nephews. She was predeceased by a daughter, Frances M. Swihart, a son, Robert E. Swihart, two sisters, Lauree Holmes, Conolia Wade, and six brothers, Doyle, Henry, Noble, Everett, Earl, and Thomas Joyner. Friends may call at the O’Rourke & O’Rourke Inc Funeral Home, 25 River Street, Salamanca, NY on Thursday, February 7, 2019 from 2 – 4 and 7 – 9 p.m.
Funeral services will be held in the funeral home on	Friday at 11 a.m. with Rev. Michael Lonto, pastor of St. Mary’s Episcopal Church, officiating. In lieu of flowers, the family suggests memorials be sent to the Salamanca Senior Center, 18 Main Street, Salamanca, NY. E-condolences can be sent to orourke.orourkefh@gmail.com or posted to facebook.com/onofh.